There is muddling through, and there is kicking the can down the road. Although neither is conclusive, the former is more purposeful. The budget deal announced yesterday – the “Bipartisan Budget Act” – challenges judgment with respect to its classification between these two pigeonholes. There is some good news here. The press has reported that the deal eliminates the risk of a government shutdown either this year or next. That is not correct, at least not literally. The government will shut down on January 15, 2014, and then again on October 1, 2014, if the Congress does not pass, and the President does not sign, appropriations bills (in addition to this deal) to keep the government funded and open. However, unless and until this deal becomes law, the two Appropriations Committees of the Congress do not have the agreed-upon targets such that they can even try to pass those bills. There are indications that the Appropriations Chairs have had significant input to the numbers in the deal, and that those Chairs are therefore now prepared to write those bills. If so, then we are at least positioned to avoid government shutdowns, even though we have not yet done so. The economy is shaky enough that it really does not need another shutdown shock. Making a real step toward avoiding a shutdown crisis (although not fully accomplishing that goal, which this piece of legislation could not possibly do) for the next 22 months is clearly a positive. Chalk one up for the Bipartisan Budget Act. Also give the negotiators credit for standing close enough together to fit in one television shot. Very little has been accomplished or even attempted on a bipartisan basis in Washington in recent months and years. Budget chairs Ryan and Murray will catch a fair amount of flak within their own parties for even appearing to work together, so kudos on this front too. Furthermore, the deal provides some relief from the budget “sequester” in this fiscal year and next, which are arguably the worst-affected years in the next eight that are covered by that irrational budget mechanism. There is plenty more pain and irrationality to come in succeeding years – and even with the sequester fix these two years are not great either – but still, this relief is unquestionably welcome. The deal “pays for” that sequester relief with savings that will arrive later, and this timing makes sense from the point of view of managing the nation’s macroeconomic policy. So that is another positive. 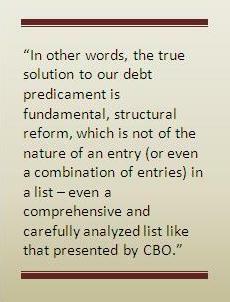 That said, do not forget that the potential January 15 shutdown was not the only pending early-2014 crisis. We go on debt-limit watch again on February 7 – and the debt limit is a more malignant issue by far than a government shutdown. As an Act of Congress, this deal, at least in theory, could have increased the debt limit and taken that risk off the table. It did not. This is not to lay personal responsibility on the budget-deal negotiators; they may not have been given a green light on the debt limit by their leaderships. But failing action in the budget deal leaves the larger dark cloud hanging over the economy, even while it dissipates the smaller. You certainly should enjoy your holidays, but please do not put your guard down just yet. 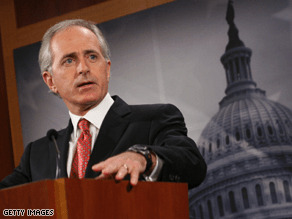 Senator Bob Corker (R-TN) presented his own budget plan in an opinion column in the November 26 Washington Post. Three cheers (gross) for Senator Corker. His plan is balanced, in that it includes both spending reduction and revenue increases, and therefore takes on the most recalcitrant members of the two political extremes in Washington. Two boos (gross) for the specific content of his plan, and for how he proposes to make it happen. So one cheer (net), and a hope that others follow along and, in the fullness of time, achieve three cheers (net) and make a solution happen.